Every month I write a detailed report sharing exactly how much I earned online and where it comes from. Although the numbers are there for you to see, what’s more important are the lessons learned to make those numbers happen. Every month I try new things and sometimes they work—and sometimes they don’t—but I’m always happy to share my results with you here so you can learn from them, too. My first monthly income report from October 2008 totaled $7,906.55, which is a lot for the first month. What most people forget is that leading up to that month, I had put in a year and a half of hard work into my first online business (GreenExamAcademy.com) before I ever tried to monetize it. That time was spent struggling through the technology, creating content, building connections, and most importantly, establishing myself as a trusted authority in the niche I was serving, and still serve to this day. For a more detailed look at the history of my first online business, read about it here. Earning money online is possible, but it’s not easy. And it never happens overnight, no matter what they say. The purpose of these reports are to inspire you to take action, give you an update on what’s going on in my businesses, and show you what works and what doesn’t. The most memorable part of November was at the start of the month when I took a day trip to Los Angeles to speak twice in one day. In the morning, I was invited to Colburn School to present during a career development class. While doing research about the school, I learned that it was one of the top performance arts schools in the nation. Top class musicians and dancers, by invitation only, train there to become world-class experts at what they do. All of their waking hours are spent fine-tuning their craft, which is why when I first received this invitation, I didn’t quite understand what I could offer these students. After chatting with Nathaniel Zeisler, the instructor for the class and a long-time fan of The SPI Podcast, I learned that I could actually bring quite a bit to the lives of these students. You see, each of these students, after graduation, will be entering a massively competitive world. Their expertise is just one part of their equation for success. The other part is their “personal brand” and how that plays a role for things like auditions and making a name for themselves. Beyond that, I was also able to open up their minds about other options that are available to them as an entrepreneur. It was quite fitting that a recent episode of the SPI Podcast featured a musician with a master’s degree who built a business around his knowledge of music in order to make ends meet, which I recommended they listen to. How I could see myself leading a class about entrepreneurship in a college classroom setting someday. After the class dismissed, Nathaniel and I, along with Huei-Yuan (another faculty member and fan of the show) had lunch together. Then, they actually let me lock myself in an empty practice room with a piano to mess around and jam for an hour while they had to run off to a meeting. It was an awesome way to start the day! I didn’t know what Skid Row was, until I looked it up online. Colburn was in a super sweet part of downtown Los Angeles. The Disney Concert Hall was nearby (designed by one of my favorite architects, Frank Gehry) and a ton of museums were adjacent to the school too, which is why I was surprised when I learned what Skid Row was all about, because it was literally just five blocks away from the school. 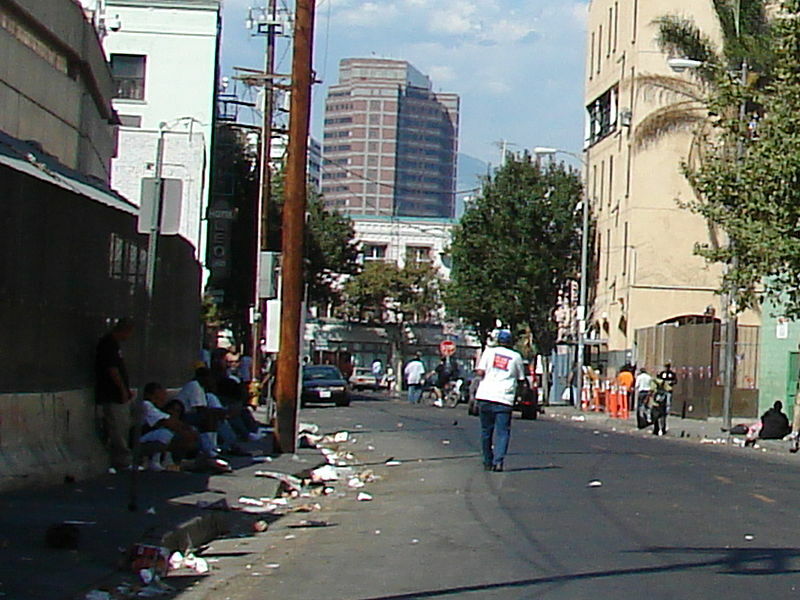 Skid Row is the most densely populated homeless area in the United States. Stable populations between three thousand and six thousand people exist in this four block radius. When I saw pictures of it online, it broke my heart to see people living in that kind of condition on the streets. When I saw it in person later that night, I was even more heartbroken. 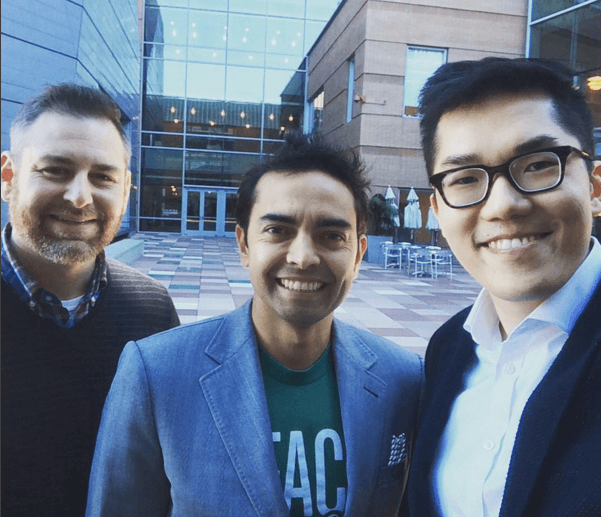 I was told to not park in the area or else I might never see my car again, so I left my car at Colburn and took an Uber to a restaurant a couple of blocks away to grab a quick bite with the event coordinator, Christopher Kai. 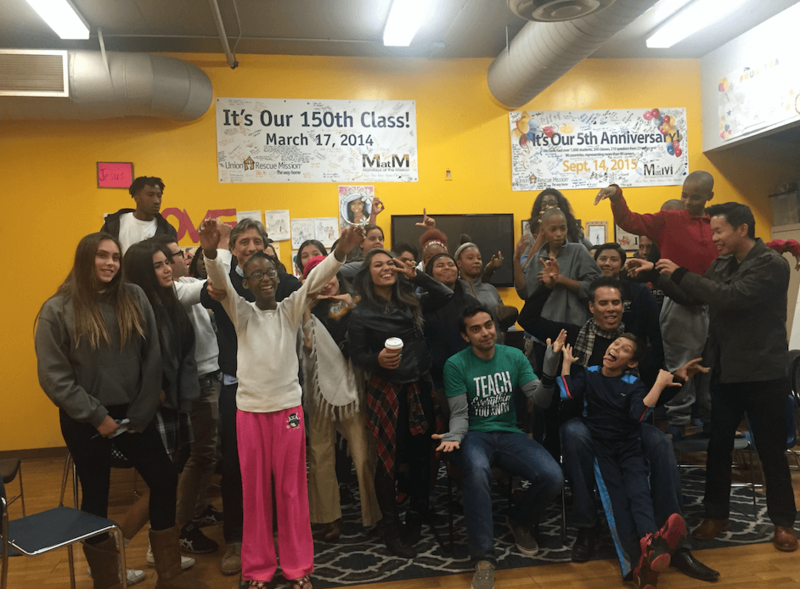 Christopher leads a gathering for kids between the ages of eight–eighteen every Monday inside Union Rescue Mission, a homeless shelter right in the heart of Skid Row. They attend this one-hour meeting to get any kind of motivation and education they can. They don’t get much support from anyone else, so to see what Christopher and his team have put together for these kids was super inspiring. I was more than glad to come by and offer any advice that I could. I also found out that several other people have come to speak and inspire these kids in the past, including Elon Musk, however he didn’t speak to the the same group of kids that I was speaking to. At this shelter, families can only stay for forty-five days before other people come and take their spot. It’s their hope that forty-five days is enough to help these people get a footing in the world and get their life back on track. The wall in the front lobby full of plaques and photos of successful “graduates” tells me that for some people it’s working. I was happy to do what I could to at least give these kids a glimpse of what opportunities are out there for them. After a quick tour of the facilities, it was time to meet the kids. They ranged between ages of eight–eighteen, some with smiles on their face, others it was obvious they didn’t want to be there, but everyone for the most part was attentive, and once Christopher started talking they were interested in learning about what we were going to talk about. After I was introduced, I was given an opportunity to share a little bit about my story. I focused on how I lost hope a lot of times along the way, but it was through thinking about my future and getting help from others that I was able to stay motivated. I also introduced them to what becoming an entrepreneur means, and how it’s really just someone who is focused on solving other people’s problems. Then, we played a game where groups were formed and each group had a random item assigned to them, like a fan, a toothbrush, and a shoe. Each group’s task was to present to everyone else what problem their item was solving, how it solved the problem, and its the features and benefits. They were also asked to share what else could be done to that thing to make it even better. A basic exercise, but everyone got totally into it! One kid who was ten took the toothbrush his group was assigned to a whole new level, talking about other enhancements based on who was using it, be it certain age groups or genders. It was cool to see just how much their minds had expanded in that short hour, and it made the trip totally worth it! Content for SPI, including the blog posts and podcast episodes for the SPI Podcast and AskPat have been created ahead of schedule to make room for my ONE focus in November and December, and that’s my upcoming book. Will It Fly? How to Test Your Next Business Idea So You Don’t Waste Your Time and Money, is coming out February 1, (click here to sign up to get early notice and info about pre-sales) and work time in November was used primarily to finish the manuscript and ship it off to the content editor so I can get comments back about the structure and content of the book (as opposed to the line or copy editor who does punctuation and grammar, which comes later). It’s been a wild ride, but the manuscript at this point is near completion, and we’re putting the pedal to the metal on the marketing efforts now. I’ve reached out to a lot of my friends and colleagues in this space and almost 100 percent of them agreed to help promote the book in some way. Already I’ve been doing interviews for podcast episodes that will go live soon before or after the launch date, and I have a few guest posts in the works too. Here’s a book that didn’t make the cut. You’ll hear more about this soon I’m sure. Thanks for the support, and I can’t wait to share it with you! Again, if you’d like to sign up to get early notice of when it becomes available, click here. Okay, now to the numbers for November. November came, of course, with Thanksgiving (at least for those of us in the United States), and with that came a little bit of time to step away from the madness of my upcoming book launch to reflect on what I am thankful for. I shared a little video on YouTube and Facebook that I’d like to embed here for you below, just in case you missed it, to share how thankful I am for you and your support over the course of this year, and for many of you, for several years now. I’ve been focusing on my “one thing” (my book) for the last few months now, and it’s been nice to have the businesses continue to run while I shift my focus into what’s at the top of my priority list right now. I’m excited, but nervous about this book—but I know that means it’s important to me, and hopefully you can get a ton out of it for you and your future when it comes out this coming February. Until then, let’s finish off the month and year strong, and gain some acceleration into the new year so we can start off even stronger! Cheers, and all the best to you!